How To: I started by applying the golden shade of shadow in the Marche aux Puces duo to my lid, continuing with the burnt brick reddish hue along the crease. I smoked the burnt brick hue up and out just a bit so that when I applied the gel liner, it would blend better. I used a thin brush and, starting with a kitten wing (not a complete cat eye wing), I worked my way inward creating a thin line on my upper lash line. The gel liner is an extremely dark plum shade and, while you may think it would clash with the reddish undertones of the other products, it actually complimented them quite nicely (both shadow and liner have a hint of maroon in their color spectrum). The blush is highly pigmented in a red shade so I used a very small amount, dabbing my brush, blowing the excess, and applying from just under my pupils in an upward sweeping motion toward my hairline for a more dramatic effect. I finished with lips, using the Mattene lipstick in Camden Chic, again, a brackish red, but found it to be a bit too matte for the look, so I applied the Lipglass in Restless over the top, focusing on the center of my lips to add shine and punch. The result is not your average crimson red but a deeper, more vibrant red that actually matches the changing colors of fall’s leaves. 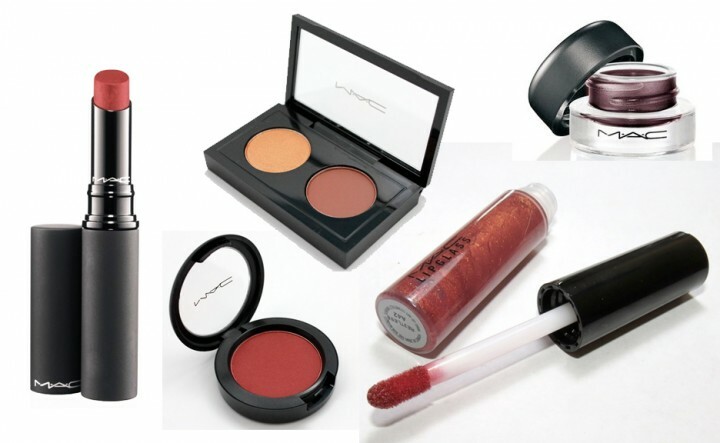 Did You Know: Colored eyes are big for fall, especially ones in the red color spectrum – burnt brick mixes reds, oranges and browns to bring you a wearable take on the trend. MAC’s duo shadows are perfect for the woman who isn’t certain of her lid and crease color matches. Always use the lighter hue as your main, lid color, and the darker shade as your crease color. You can also apply the darker shade under your lower lash liner for a more traditional smoky eye. This lip pairing is my favorite in the collection, and sure to be a huge fall hit. *Unless otherwise noted, face makeup is: Make Up For Ever HD Foundation, RMS Beauty “Un”Cover-Up in #22. Brows are Anastasia Brow Pencil in Brunette and Anastasia Clear Brow Gel. Mascara isLancome Definicils High Definition Mascara in Deep Black. *Like the look? Leave a comment below and tweet @beautybanter with your favorite looks! We will be choosing one winner and gifting a massive fall 2012 beauty goodie bag after we have unveiled all 10 brands and their looks… more details to come, but start by leaving a comment and tweeting to us your favorite looks!